Welcome to the Dursley Glos Web, created as a local history guide to the town of Dursley in Gloucestershire, England in which I now live. It also contains information about the surrounding area and its close neighbours, Cam and Uley. The site has a slight emphasis on the town's transport links and its industrial past but my intention is to make it of interest to anyone wanting to find out more about any aspect of the town's history. The site contains a number of photographic collections showing the development of transport and industry in Dursley as well as extracts from old mapping dating back to the early 20th Century. Most of the website content relates to the past but information on current developments is added as they happen. There is also much information about the town's streets, its public buildings, churches, schools and pubs as well as photographs of the town's changing face during the large scale demolition in the 1950s and 1960s. From a different perspective, there is a slide show of views from the top of St. James Parish Church and another showing a collection of old postcards documenting the town from the beginning of the 20th century. The month of December saw continued progress on the Littlecombe site, with new houses near Long Street, now completed and clearly visible from the town's streets. The link road through the site has been partially opened to allow access to some of these and traffic is able to make its way directly to Lister Street via the newly laid out junction near the Priory. Withe the festive season close, Christmas displays were visible in this area too to brighten up the surroundings. Do you remember any of the old shops in Dursley town centre in days gone by? The Dursley & Cam Society is embarking on a project to record the change of use of the retail and business premises in town and is keen to hear from anyone who might have some information about shop names, owners and dates. If you do have something to share please do email me or perhaps join the Forum to contribute to the project. Would you like to become involved and perhaps help shape the future of Dursley Heritage Centre? We are looking for anyone who is keen on the town's history to become involved in this important asset to the town. It might be to assist on open days, to take on research into a particular subject related to the town, to organise exhibitions or to assist with cataloging of the artefacts. With this in mind, there is to be an informal meeting, open to everyone, at 11.00am on Saturday 26th July 2014 in the Methodist Church Hall (at the rear of the church). Whatever you might be interested in we'd be very pleased to see you and hear your thoughts on the centre's future. If you want to know any more then please email me. History comes alive when related by its residents and personal recollections are not forgotten. A number of these are available in audio format so you can listen as you browse. In fact, I have tried to portray as much as I can find on many aspects of the history of the area and I intend to extend this to include further historical information as I find it. For those who want to obtain information in a more usable format, perhaps for research purposes, a number of the documents on the site are also available for download. Dursley's own Heritage Centre aims to provide a door on to its past for residents and visitors alike. It can be found next to Jacob's House, now fully restored, and is centrally positioned near the Methodist Church and the Market House. The present is not forgotten though and I have included many photographs from recent times as well as a comprehensive 1000+ image virtual tour of the town in which you will be able to navigate your way around any of its streets with the click of a mouse. This photo tour was completed in 2003 as a snapshot of the town - consequently several areas of town have changed subsequently. Looking back over the last few years, Dursley has seen dramatic changes to its landscape and facilities - a brand new, state of the art Secondary School, new library, new fire station and numerous new housing developments around town. It's not over yet though and the town centre is continuing to change as we look forward into 2018 and beyond. Anyone interested in local history might like to consider coming along to one of the illustrated talks given by The Dursley & Cam Society, the town's local history group. The society meets on the second Tuesday of every month from September through to July in Dursley Town Hall at 7.30pm. Members and visitors alike are very welcome. 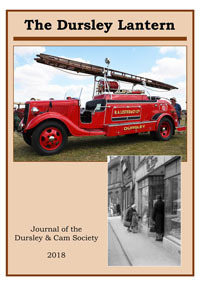 The latest edition of the Society's annual journal, "The Dursley Lantern" is now available for sale in Dursley Heritage Centre or by post. Most back numbers are also still available. Further details of the Society, its events and "The Dursley Lantern" can be found on The Dursley & Cam Society page. I would be really interested to get any feedback on the contents of the site and if anyone has additional information I could use then that would be even better. When all said and done, this website only scratches the surface of the town's history and I hope to extend it over the coming months and years. I am always interested in anything related to Dursley or the area around it and would like to hear from any of its past or present residents. All comments, questions and information are welcome and you can email me directly, leave a message in my Guestbook or perhaps start or join a discussion in the Forum. For further information on any aspect of the Dursley area then some suggested reading is given on my bibliography page. Unless otherwise identified, all photos and text on this site are the copyright of Andrew Barton. No other copyright has been intentionally violated but if you believe there is good reason to question the appearance of any material then please send me an email explaining the circumstances and I will be glad to remove the item.